Option 1: Log-in to the OnStar portal with your credentials and go to “OnStar Packages” to purchase your OnStar service package.Subscribe via the OnStar portal now! Link to OnStar portal. Option 2: Press the blue Service Button in your car to talk to an OnStar advisor. They will assist you in ordering the continuation of OnStar services. 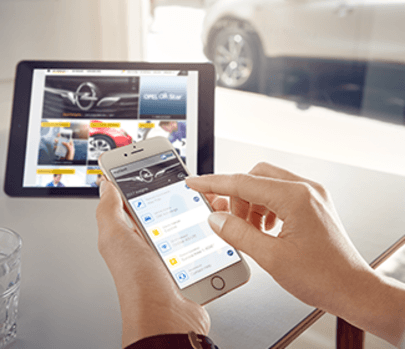 1If after your trial you do not purchase an OnStar subscription, you will no longer be able to use OnStar services or be able to access the OnStar features in the myOpel app. Even without an active OnStar subscription, you will still receive Vehicle Diagnostics in a monthly e-mail for 4 additional years, if you do not opt out. 2 OnStar Services require activation and are subject to mobile network coverage and GPS availability. Charges apply after the free trial period. The OnStar subscription packages could be different from the services included in the free trial package. Some features may not be available for certain carlines or trim levels. Terms and conditions apply. 3If your car is within the Opel Roadside Assistance coverage period and policy terms, OnStar can provide roadside assistance support for free. If your car is outside its Opel Roadside Assistance coverage period or policy terms, [INSERT LOCAL PROVIDER, e.g., the AA, ADAC] may charge you for their services.